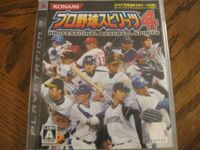 "Professional Baseball Spirits 4 (プロ野球スピリッツ4, Pro Yakyū Spirits 4) is a baseball video game published by Konami for the PlayStation 2 and PlayStation 3 in Japan in May 1, 2007. It is the sequel of Pro Yakyū Spirits 3. Around the time of its release, it was the only PlayStation 3 videogame title that was among the top 50 best selling videogames in Japan." Source: Wikipedia, "Professional_Baseball_Spirits_4," available under the CC-BY-SA License.